Create a force of influence for your content. To convey a message, mobilize buyers, and reach the right people at the right time, content marketers are turning to influencers. Influencers are topic experts, thought leaders, or brand advocates who possess strong credibility and/or an extended reach with your target audience. There are many ways to involve influencers in your content creation efforts, but how can you get influencers to share your content, help expand your reach, and put your content in front of even more relevant eyes? Remember the golden rule of influencer marketing – give, give, give – and you can begin tapping your influencers for help sharing your content. If your content is helpful, inspiring, relevant to their audience and/or about them, by simply mentioning the influencer’s Twitter handle in your social posts you are likely to get their attention and potentially a Retweet. Tip: Before you start Tweeting your content at all kinds of influential people, do your research. If you are monitoring relevant influencers, know what they are interested in, and what is relevant for their audiences, you can create content you know they’ll want to share. (You’ll do even better if you quote them or link to their content in yours.) Then, when you mention them they’re likely to share! A good way to create content that’s likely to get shared by thought leaders is to curate a list with them included in it. Once you’ve created your curated list post, be sure to Tweet each influencer you’ve included and let them know! Tip: This is a good way to get influencers’ attention initially, but you should continue to build on that relationship over time. Getting an influencer to contribute a guest post on your blog is great for so many reasons. Firstly, you get great content for your blog that your audience will love. Secondly, it lends credibility to your blog – if you can get a thought leader to post for you, you must be doing something right. Thirdly, the expert is likely to share that post with their networks. And lastly, you get a new post published without having to write it yourself! 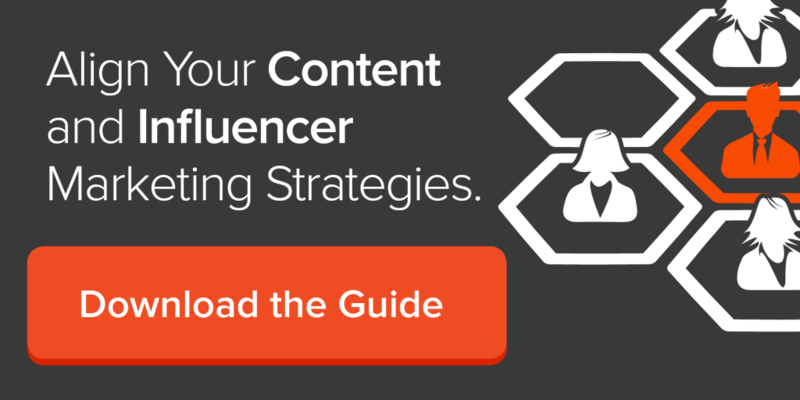 For 3 more tips on how to get influencers to share your content (and lots more), download Traackr and Hubspot’s eBook, The Content Marketer’s Guide To Influencer Marketing.